Fast-food chain Burger King has launched its own crypto-currency, called WhopperCoin, in Russia. Customers will be able to claim one coin for every rouble (1.3p) they spend on the Whopper sandwich. 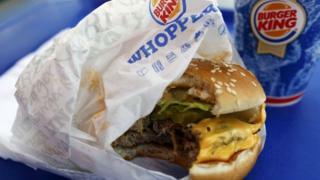 Russians will be able to buy a Whopper with the virtual cash, once they have amassed 1,700 whoppercoins. The company said it would release Apple and Android apps next month so people could save, share and trade their wallet full of whoppercoins. Ivan Shestov, head of external communications at Burger King Russia, said the scheme turned the Whopper into an "investment vehicle". Dr Garrick Hileman, research fellow at the Cambridge Centre for Alternative Finance, said Burger King was the first major corporate brand to issue its own crypto-cash but he expected others to follow. "Traditional loyalty programs, such as airline miles, typically have a fairly limited range of exchange options," he said. The ease with which the branded crypto-currencies could be traded for other national currencies or even other assets could make them "more compelling" than a standard loyalty scheme, he added. But one issue that corporate issuers had to confront, he said, was who else would accept their crypto-currency. "I don't imagine McDonald's will be quick to allow someone to pay for a Big Mac with their whoppercoins," he said. "Burger King's competitors are more likely to accept an independent crypto-currency like bitcoin." Commenting on Twitter, Emin Gun Sirer, an associate professor at Cornell University and a director at the Initiative for Cryptocurrencies and Contracts, said there were likely to be launches of other schemes. "Reward points are actually a good use case for blockchains," he said. However, in a later conversation, he warned that they could be used for money laundering and ransomware payments. "This will undoubtedly happen," he said.